On Saturday April 16, I organize a hike to Mont de Grange 2432 m. Le Mount de Grange is the central and one of the highest summits of the Chablais. It constitutes almost a massif by itself. Its vast and generous sidewalls offer many pastures. The summit offers an excellent view of 360 ° over the Dents du Midi, Mont Blanc and the Matterhorn. We will start from the Chapel de St.Theodule 1310 m (Abondance) and descend by same way. This route has not technical difficulty. But it is sportif. 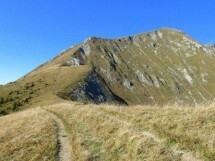 A gradient of 1150 m and a distance of 11 km. Walking time: about 6 hours.